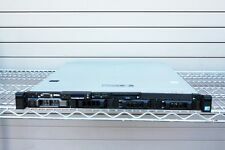 This Dell PowerEdge R610 Gen II 1U Rackmountable Server is in good, clean condition. The server may have scratches due to palletizing and racking. Model Dell PowerEdge R610 Gen II. Hard Drives 2x NEW Samsung Evo 250GB SSD for Dell R-Series. This is a short depth server. SuperMicro 1U Chassis. 16GB RAM (4x4GB). • No Hard Drive - supports six hot-swap SAS/SATA drives at 3Gb/s. • Four (4) USB 2.0 ports. Rear I/O Ports • Twelve (12) 240-pin DDR3 DIMM slots (three occupied). • Two (2) CPU sockets (one occupied). Warranty good until July 27, 2021. This is a short depth server. SuperMicro 1U Chassis. 16GB RAM (4x4GB). SuperMicro X9SRI-F Motherboard. Series: L5520. 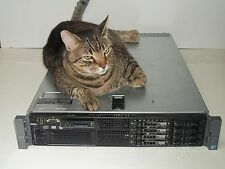 Model: PowerEdge R510. Size: 12gb. Form Factor: Server - 2U. Type: Xeon. Type: DDR3. Ports: 4x USB, 3x Ethernet, 2x VGA, 1x Serial, 1x SD Card. All manufacturers' warranties are void unless otherwise stated. This Dell PowerEdge R610 Gen II 1U Rackmountable Server is in good, clean condition. The server may have scratches due to palletizing and racking. Model Dell PowerEdge R610 Gen II. Dell & HP Servers. This Dell PowerEdge R610 Gen II 1U Rackmountable Server is in good, clean condition. The server may have scratches due to palletizing and racking. Model Dell PowerEdge R610 Gen II. Hard Drives 2x Samsung Evo 250GB SSD for Dell R-Series. Model: Dell PowerEdge R620. CPU Model: 2x Xeon E5-2609. 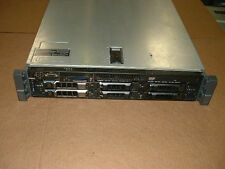 This Dell PowerEdge R610 Gen II 1U Rackmountable Server is in good, clean condition. The server may have scratches due to palletizing and racking. Model Dell PowerEdge R610 Gen II. MPN Dell R610 33247. Form Factor: 1U. HDD: No HDD included. Includes 4 3.5" HDD Sleds without screws. Condition: Used, Tested Working. Does NOT include Rail Kit. Model Dell PowerEdge Dell PowerEdge R610. Dell & HP Servers. That's right, we perform a clean install on each server. For most servers, we load a clean install of Windows 2016 Server evaluation edition. Dell Poweredge R710 2U Server. 2x 146gb 10k 2.5" SAS Drives. Rails / Bezel. 2x 870w Power Supplies. 4x Onboard Gigabit Ethernet. 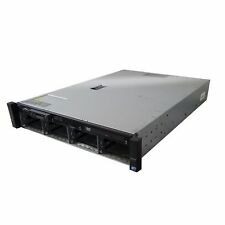 This Dell PowerEdge R610 Gen II 1U Rackmountable Server is in good, clean condition. The server may have scratches due to palletizing and racking. Model Dell PowerEdge R610 Gen II. Hard Drives 3x Dell R-Series 2.5" SAS 600GB 10K Hard Drive. This is a short depth server. SuperMicro 1U Chassis. SuperMicro X9CL-F Motherboard. Supermicro CSE-216. NO Processors Installed ( MOTHERBOARD PART# X9DRH-7TH )( QTY 2 HEATSINKS INSTALLED ). NO Processors ( MOTHERBOARD PART# X9DRH-7TH) ( QTY 2 HEATSINKS INSTALLED ). NO SAS/SATA 2.5IN Hard Drives Trays Installed ( 2.5IN INTERFACE ). Server Type DELL POWEREDGE R720xd. Processor(s) 2x HEATSINKS INCLUDED, NO PROCESSORS. Gigabit Ethernet DELL QUAD PORT GIGABIT ETHERNET DAUGHTER CARD. Drive Bays 24x 2.5" SFF SAS/SATA DRIVE BAYS. Hard Drive(s) NO (HDDs or TRAYS) INCLUDED. Model Dell PowerEdge R710. Hard Drives 2x Enterprise 600GB 10k 2.5" SAS Hard Drive. Parts By Server. Dell & HP Servers. That's right, we perform a clean install on each server. For most servers, we load a clean install of Windows 2016 Server evaluation edition. Dell Poweredge R710 2U Server. 2x 300gb 10k 2.5" SAS Drives. Rails / Bezel. 2x 870w Power Supplies. 4x Onboard Gigabit Ethernet. 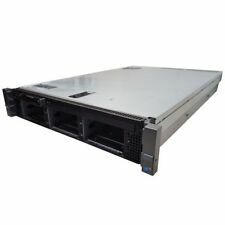 This Dell PowerEdge R610 Gen 2 1U Rackmountable Server is in good, clean condition. The server may have scratches due to palletizing and racking. Model Dell PowerEdge R610 Gen 2. Hard Drives 3x Dell R-Series 2.5" SAS 600GB 10K Hard Drive. Physical condition of the server is good & the server boots with no issues. Not sure what exact Xeon CPU that it has but I think it was mid-level. 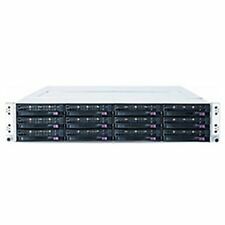 Dell PowerEdge R320 4-Bay LFF Server 1x E5-2420V2 6-Core 2.20GHz, 24GB RAM, 3x 400GB 10K SAS Hard Drives, PERC H310 Mini. 3x 400GB 10K SAS Hard Drive (Dell Part # GY583). 24GB (3x8GB) PC3L-8500R DDR3 1067MHz RAM. PowerEdge R410. Hard drives are not included, but all four caddies are. Hard Drive Optical Drive None Included. Defects: Minor case scratching/scuffing. No exceptions. We have a limited knowledge of their prior use. Supermicro 2U 8x 3.5" Drive Bays. Backplane: BPN-SAS-825TQ 8-port 2U TQ (W/ AMI 9072) backplane. Drive bay: 8x 3.5" Supermicro caddy. Rail Kit: Rail Kit Generic Supermicro 3rd party. Server Chassis/ Case: SYS-6027R-3RF4 . For information-technology professionals, finding the right server can greatly improve the overall lifecycle and demand of your growing business. When shopping for new and used servers, it is important that you pinpoint one that has the ability to meet the needs of your company. You can find a wide selection of pre-owned servers from brands like Lenovo, Dell, and HP on eBay, and they're reasonably priced to meet your IT needs. Which used servers can handle heavy loads? Dell PowerEdge Series (R910): This server is crafted with the ability to manage workloads that are demanding in nature. The used servers in this series can be customized to your liking as well. Featured in this four-socket server are processors from the Xeon 7500 Series. This processor is equipped with a storage capacity that tops out at 1TB of DDR3 memory. HP ProLiant Series (DL380): This server is built to regulate energy efficiently during usage. While being used, it will also shift energy usage according to the specific needs of each application while being used. This server is able to manage two six-core, quad, and dual processors from the Intel Xeon 5600 series. Dell PowerEdge Series (R720): This rackmount server is known for boosting the overall performance of Intel Xeon processors. It is constructed to be able to house 12 core processors if needed. When handling heavy tasks, the ability to speed up processing is enabled. Can an HP ProLiant 360e work for differently sized businesses? Yes. Unlike previous ProLiant 360e generations, there have been improvements in performance that allow you to manage your business needs on a larger scale. It is built with two processors that come with DIMM slots at a max capacity of 12 and up to 25MB of cache. 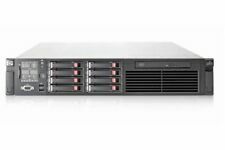 The HP ProLiant 360e can be used for service providers, businesses that are small or midsize, and corporate data centers. Which used servers are good for the management of email? The Dell PowerEdge R720xd works well for email servers. It is built to house a max of two Intel Xeon E5-2600/E5 2600 v2 processors. Twenty-four DIMMs are also supported in this system. Its ability to carry a large capacity for storage makes it a great choice when you're seeking used servers that work well for data applications that are intense. Email servers fit into this category.